Picture this - a Native American wearing a dead crow on his head, and a masked white man with an itchy nose, both buried in sand up to their necks, bickering their heads off on the subject of war. Suddenly a horde of cavalrymen (on their way to wipe out the aboriginal Comanche tribe) rides over the hilariously exposed crowns of our two central protagonists. 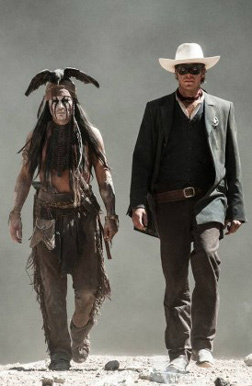 Gore Verbinski resurrects the mythic American outlaw, the "Lone Ranger", and his sidekick Tonto, with a script that juxtaposes the comic and the cruel, and jumps cuts from the tragic to the ludicrous, leaving the viewer feeling a wee bit light-headed. The original Lone Ranger (first popularized as a radio show, and then as a television series) was a steadfast vigilante firing silver bullets and capturing all sorts of crooks. Your standard fare of "good versus bad". John Reid (Armie Hammer), a.k.a. the Lone Ranger, along with his trusted mate, Tonto (Johnny Depp), soon became a symbol of justice in American popular culture. But what are you to make of a character who quotes the English philosopher John Locke, refuses to play the part he is destined to play, and turns down every offer of working a gun? And what of the "trusted buddy" who has a back story far more painful than that of the "hero", and who refuses to be a sidekick, and cannot be trusted? There you have it. A 21st century postmodern rendition of herogiri, retold from the perspective of the sidekick. A Western revisited, so if you like your wild West unadulterated, then this is not your cup of sand. A posse of Texas Rangers, on their way to capture the dreaded baddie, Butch Cavendish (William Fichtner), rides into an ambush, and all 7 are murdered mercilessly. A member of this contingent, the educated lawman John Reid, survives (saved by his elder brother, who in turn dies), and is brought back to health by the Native American, Tonto. The plot traces the adventures of this mismatched duo as they traverse the Californian desert in search of Cavendish, and soon discover a deeper and more sinister plot at work. Tonto tries to convince John Reid to don a mask, so as to safeguard his identity, and to take up arms against the villains who killed his brother. John, betrayed by the so-called upholders of justice, finally relents, even though every single character in the film comes up with a "what's with the mask?" gag. The plot weaves in the familiar trope of savagery and civilization; corrupt railroad corporations, the white man's lust for expansionism, and the subsequent marginalization and massacre of the Native Americans. The comic relief functions as a means to contain the horrors of this historical carnage, and to justify, somewhat, the heavy tonal shifts in Verbinski's direction. On the whole, the tone of the film is irreverent. It mocks the very concept of the "origins" story of a hero. Throughout the film, the reluctant hero (with a heart of gold) bungles through hazardous situations. We also see him clutching a dainty pink parasol as he rides behind Tonto. The movie undercuts the viewer's expectations of a masculinity that pervades the Western film genre. There is no John Wayne or Clint Eastwood in this world, and the filmmaker knows it. Then we have Depp's character, a kooky Tonto, who leaves us wondering whether he is a genuine shaman, or mentally unstable, or a trickster, or worse - all of the above three. Unfortunately, the verbal sparring between the Lone Ranger and Tonto tested our patience off and on. Especially when we spied shades of Jack Sparrow (Pirates Of The Caribbean) in Tonto. Depp is known to be unaffected by box-office concerns and other such mundane realities, but where does one draw the line between unaffected and uninspiring? Or could it be that writers, Ted Elliot and Terry Rossio are still suffering a hangover from the Pirates' franchise? Hammer, on the other hand, supplements his role with adequate spirit, as does actor William Fichtner, as the vile Cavendish with a fetish for silver mines and human flesh. Cinematically, Bojan Bazelli captures the sterile beauty of the desert without romanticizing it. What you can most definitely look forward to are the two action sequences placed strategically in the beginning and the end of the film. These chase scenes, filmed on moving trains, are extremely well-constructed, and confident in their sweeping visuals and CGI effects. The final chase-and-fight spectacle is almost half-an-hour long, but when the famous Lone Ranger theme music, Hans Zimmer's rendering of Rossini's William Tell Overture kicks in, it uplifts the scene to a whole new level. Also, the gags and wisecracks that lace the violence in these bits are quite entertaining. One may ask whether the film does justice to the original Lone Ranger. Eventually, it does not matter. One may ask whether one should go watch this new Lone Ranger. Eventually, what else is playing in the theatre matters. If you have already seen Despicable Me 2, then go watch this. 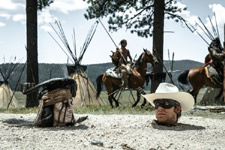 Be the first to comment on The Lone Ranger! Just use the simple form below. fullhyd.com has 700,000+ monthly visits. Tell Hyderabad what you feel about The Lone Ranger!